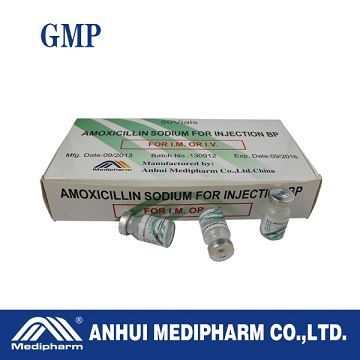 Indications: Amoxicillin is a broad-spectrum aminopenicillin and is indicated in the treatment of bacterial infections such as actinomycosis, biliary-tract infections, bone and joint infections, acute exacerbations of chronic bronchitis, gastroenteritis, (including Escherichia coli enteritis and Salmonella enteritis, but not shigellosis), gonorrhoea, mouth infections, sinusitis, otitis media, pneumonia (except where Mycoplasma suspected), typhoid and paratyphoid fever, urinary-tract infections, bacterial meningitis and the prophylaxis of endocarditis. It is also used in the treatment of Lyme disease. Contraindications: Penicillin hypersensitivity. Glandular fever and lymphatic lymphoma. Bacterial resistance to amoxicillin or ampicillin. Storage: Store below 25℃. Protect from moisture and light. Keep out of reach of children.